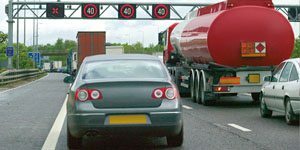 Test yourself on your knowledge of motorway rules in the highway code with these 66 questions from the DVSA revision question bank on joining and exiting, lane choice, overhead signals, and Active Traffic Management. The average score for this test is 87%. Can you beat that? Using your hazard lights, as well as brake lights, will give following traffic an extra warning of the problem ahead. Only use them for long enough to ensure that your warning has been seen. White studs are found between the lanes on motorways. The light from your headlights is reflected back and this is especially useful in bad weather, when visibility is restricted. Before you start your journey make sure that your vehicle can cope with the demands of high-speed driving. You should check a number of things, the main ones being oil, water and tyres. You also need to plan rest stops if you’re going a long way. You MUST stop if there are red lights flashing above every lane on the motorway. However, if any of the other lanes do not show flashing red lights or red cross you may move into that lane and continue if it is safe to do so. If the vehicle in front shows its hazard lights there may be an incident or queuing traffic ahead. As well as keeping a safe distance, look beyond it to help you get an early warning of any hazards and a picture of the situation ahead. You MUST obey this sign. There might not be any visible signs of a problem ahead. However, there might be queuing traffic or another hazard which you cannot yet see. Traffic on motorways usually travels faster than on other roads. You need to be looking further ahead to give yourself more time to react to any hazard that may develop. The emergency services need to know your exact location so they can reach you as quickly as possible. Look for a number on the nearest marker post beside the hard shoulder. Give this number when you call the emergency services as it will help them to locate you. Be ready to describe where you are, for example, by reference to the last junction or service station you passed. Ideally you should plan your journey so that you have regular rest stops. If you do become tired leave at the next exit, or pull in at a service area if this is sooner. You should normally travel in the left-hand lane unless you are overtaking a slower- moving vehicle. When you are past that vehicle move back into the left-hand lane as soon as it’s safe to do so. Don’t cut across in front of the vehicle that you’re overtaking. • bright green/yellow – roadworks and contraflow systems. In cases of breakdown or emergency try to get your vehicle into an Emergency Refuge Area. This is safer than just stopping on the hard shoulder as it gives you greater distance from the main carriageway. If you are able to re-join the motorway you must take extra care, especially when the hard shoulder is being used as a running lane. When approaching a contraflow system reduce speed in good time and obey all speed limits. You may be travelling in a narrower lane than normal with no permanent barrier between you and the oncoming traffic. Be aware that the hard shoulder may be used for traffic and the road ahead could be obstructed by slow- moving or broken down vehicles. Due to the danger from passing traffic you should park as far to the left as you can and leave the vehicle by the nearside door. Do not attempt even simple repairs. Instead walk to an emergency telephone on your side of the road and phone for assistance. While waiting for assistance to arrive wait near your car, keeping well away from the carriageway and hard shoulder. Traffic is passing you at speed. If the draught from a large lorry catches you by surprise it could blow you off balance and even onto the carriageway. By facing the oncoming traffic you can see approaching lorries and so be prepared for their draught. You are also in a position to see other hazards approaching. Mandatory speed limit signs above all lanes including the hard shoulder, show that you are in an Active Traffic Management (ATM) area. In this case you can use the hard shoulder as a running lane. You must stay within the speed limit shown. Look out for any vehicles that may have broken down and be blocking the hard shoulder. A red cross above the hard shoulder shows it is closed as a running lane and should only be used for emergencies or breakdowns. At busy times within an Active Traffic Management (ATM) area the hard shoulder may be used as a running lane. This will be shown by a mandatory speed limit on the gantry above. Don’t forget that you’re towing a trailer. If you’re towing a small, light, trailer, it won’t reduce your vehicle’s performance by very much. However, strong winds or buffeting from large vehicles might cause the trailer to snake from side to side. Be aware of your speed and don’t exceed the lower limit imposed. You won't be able to drive unaccompanied until you've passed your practical driving test. When you’ve passed, it's a good idea to ask your instructor to take you for a lesson on the motorway. Alternatively, you could take part in the Pass Plus scheme. This has been created for new drivers and includes motorway driving. Ask your instructor for details. You should not normally stop on a motorway but there may be occasions when you need to do so. If you are unfortunate enough to break down make every effort to pull up on the hard shoulder. • get too close to the vehicle in front of you. Be aware that there will be no permanent barrier between you and the oncoming traffic. On a three-lane motorway you should travel in the left-hand lane unless you’re overtaking. This applies regardless of the speed at which you’re travelling. Stay in the left-hand lane long enough to get used to the higher speeds of motorway traffic. You should give way to traffic already on the motorway. Where possible they may move over to let you in but don’t force your way into the traffic stream. The traffic may be travelling at high speed so you should match your speed to fit in. You should keep to the left-hand lane whenever possible. Only use the other lanes for overtaking or when directed by signals. Using other lanes when the left- hand lane is empty can frustrate drivers behind you. On a motorway all traffic should use the left-hand lane unless overtaking. Use the centre or right-hand lanes if you need to overtake. If you’re overtaking a number of slower vehicles move back to the left-hand lane when you’re safely past. Check your mirrors frequently and don’t stay in the middle or right-hand lane if the left-hand lane is free. • pull onto the hard shoulder (unless in an emergency). If you are towing a caravan or trailer you must not use the right-hand lane on a motorway with three or more lanes, except in certain circumstances, such as lane closures. The studs between the carriageway and the hard shoulder are normally red. These change to green where there is a slip road. They will help you identify slip roads when visibility is poor or when it is dark. Travelling at the national speed limit doesn’t allow you to hog the right-hand lane. Always use the left-hand lane whenever possible. When leaving a motorway get into the left-hand lane well before your exit. Reduce your speed on the slip road and look out for sharp bends or curves and traffic queuing at roundabouts. Along the hard shoulder there are marker posts at 100-metre intervals. These will direct you to the nearest emergency telephone. Collisions can often happen at roadworks. Be aware of the speed limits, slow down in good time and keep your distance from the vehicle in front. Wait for a safe gap in the traffic before you move out. Indicate your intention and use the hard shoulder to gain speed but don’t force your way into the traffic. It is against the law to reverse, cross the central reservation or drive against the traffic flow on a motorway. If you have missed your exit ask yourself if your concentration is fading. It could be that you need to take a rest break before completing your journey. When a red cross is shown above the hard shoulder it should only be used for breakdowns or emergencies. Within Active Traffic Management (ATM) areas the hard shoulder may sometimes be used as a running lane. Speed limit signs directly above the hard shoulder will show that it’s open. Emergency Refuge Areas may be found at the side of the hard shoulder about 500 metres apart. If you break down you should use them rather than the hard shoulder if you are able. When re-joining the motorway you must remember to take extra care especially when the hard shoulder is being used as a running lane within an Active Traffic Management area. Try to match your speed to that of traffic in the lane you are joining. When traffic travels at a constant speed over a longer distance, journey times normally improve. You may feel that you could travel faster for short periods but this won’t generally improve your overall journey time. Signs will show the maximum speed at which you should travel. Don’t use the hard shoulder for stopping unless it is an emergency. If you want to stop for any other reason go to the next exit or service station. Red studs are placed between the edge of the carriageway and the hard shoulder. Where slip roads leave or join the motorway the studs are green. Normally you should only use the hard shoulder for emergencies and breakdowns, and at roadworks when signs direct you to do so. Active Traffic Management (ATM) areas are being introduced to ease traffic congestion. In these areas the hard shoulder may be used as a running lane when speed limit signs are shown directly above. You’ll see the first advance direction sign one mile from the exit. If you’re travelling at 60 mph in the right-hand lane you’ll only have about 50 seconds before you reach the countdown markers. There will be another sign at the half-mile point. Move in to the left-hand lane in good time. Don’t cut across traffic at the last moment and don’t risk missing your exit. Congestion can be reduced by keeping traffic at a constant speed. At busy times maximum speed limits are displayed on overhead gantries. These can be varied quickly depending on the amount of traffic. By keeping to a constant speed on busy sections of motorway overall journey times are normally improved. If the left-hand lane is free you should use it, regardless of the speed you’re travelling. On a motorway it is best to use a roadside emergency telephone so that the emergency services are able to locate you easily. The nearest telephone is shown by an arrow on marker posts at the edge of the hard shoulder. If you use a mobile, they will need to know your exact location. Before you call, find out the number on the nearest marker post. This number will identify your exact location. When an Active Traffic Management (ATM) scheme is operating on a motorway you MUST follow the mandatory instructions shown on the gantries above each lane. This includes the hard shoulder. • whether you are travelling alone. If you feel tired stop at the nearest service area. If it’s too far away leave the motorway at the next exit and find a safe place to stop. You must not stop on the carriageway or hard shoulder of a motorway except in an emergency, in a traffic queue, when signalled to do so by a police or enforcement officer, or by traffic signals. Plan your journey so that you have regular rest stops. The Driving and Vehicle Standards Agency. In some areas motorway telephones are now linked to a Highways Agency control centre, instead of the police. Highways Agency Traffic Officers work in partnership with the police and assist at motorway emergencies and incidents. They are recognised by a high-visibility orange and yellow jacket and high-visibility vehicle with yellow and black chequered markings. On motorways reflective studs are located into the road to help you in the dark and in conditions of poor visibility. Amber-coloured studs are found on the right-hand edge of the main carriageway, next to the central reservation. You should only stop on the hard shoulder in a genuine emergency. DON’T stop on it to have a rest or picnic, pick up hitchhikers, answer a mobile phone or check a map. If you miss your intended exit carry on to the next, never reverse along the hard shoulder. The right-hand lane of the motorway is for overtaking. Sometimes you may be directed into a right-hand lane as a result of roadworks or a traffic incident. This will be indicated by signs or officers directing the traffic. Only overtake on the left if traffic is moving slowly in queues and the traffic on your right is moving more slowly than the traffic in your lane. Motorways mustn’t be used by pedestrians, cyclists, motorcycles under 50 cc, certain slow-moving vehicles without permission, and powered wheelchairs/mobility scooters. You should move to another lane if it is safe to do so. This can greatly assist the flow of traffic joining the motorway, especially at peak times. Slow-moving, large vehicles might slow down the progress of other traffic. On a steep gradient this extra lane is provided for these slow-moving vehicles to allow the faster-moving traffic to flow more easily. A mandatory speed limit sign above the hard shoulder shows that it can be used as a running lane between junctions. You must stay within the speed limit. Look out for vehicles that may have broken down and could be blocking the hard shoulder. A vehicle with a trailer is restricted to 60 mph. For this reason it isn’t allowed in the right-hand lane as it might hold up the faster-moving traffic that wishes to overtake in that lane. Traffic officers don't have enforcement powers but are able to stop and direct people on motorways and some 'A' class roads. They operate in England and Wales and work in partnership with the police at incidents, providing a highly trained and visible service. They're recognised by an orange-and-yellow jacket and their vehicle has yellow-and-black markings. Try to join the motorway without affecting the progress of the traffic already travelling on it. Always give way to traffic already on the motorway. At busy times you may have to slow down to merge into slow-moving traffic.